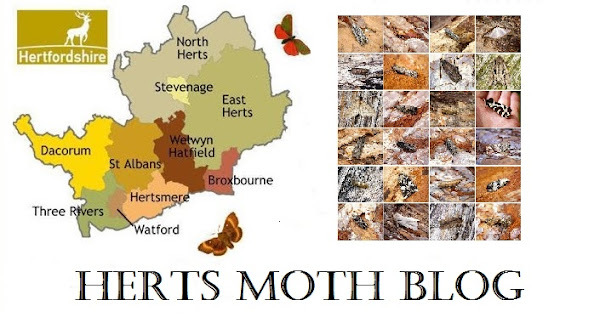 Still ticking along nicely here in Stevenage but the amount of moths has dipped dramatically this past week. Still with migrants abound its worth keeping the light burning on milder nights. Also with the lack of photography this time of year I thought I would take a few pictures of some Caddis flies (Which of course are closely related albeit more primitive than moths). Below are my recent highlights. Scarce Bordered Straw [NFG] (28/09/17) - Thursday night I was lucky to pot up a Scarce Bordered Straw on the collar of the trap, a garden first! Having recorded a Bordered Straw in 2014 it was great to add the other one to the garden list. I had a moment where I thought i'd recaptured the same moth that I had trapped on Monday night at Ashwell and where upon I released it near Hoddesdon after photographing it on Tuesday. As you can see from the photo, they are very similiar and even have the same 'nick' out of the wing! The differentiating feature is the fringe looking at the picture. Caloptilia semifascia [NFY] (28/09/17) - The commonest Caloptilia in my garden and regukar every year here since we moved here in 2012 (It took a week for one to show up back in August 2012). This particular specimen had lovely black speckling over it. Pink-barred Sallow [NFY] (29/09/17) - On Friday the catch was pretty poor but I was rewarded with only the second garden record of this Sallow species that from my experience prefers damp woodland and marshes. The last time I saw it was in 2014. Lunar Underwing (28/09/17 and 29/08/17) - On both nights, Lunar Underwing has been the commonest moth in the trap and a lovely dark individual with black spots on the termen was selected for a photo.